I’ve been trying to “shoot in the moment” in response to the weekly photo ﻿challenge. But this week the challenge is ﻿curve﻿, and I immediately thought of a photo in the archives that totally fits…and I just like it. Western Washington is blessed each spring with Kwanzan cherry blossoms. Big, fluffy, showy poofs that fill me with delight. I will never tire of them. And though I mourn their short season I also respond to Kwanzan “snow” with a delight that is almost parallel to that felt when the blossoms are on the trees. 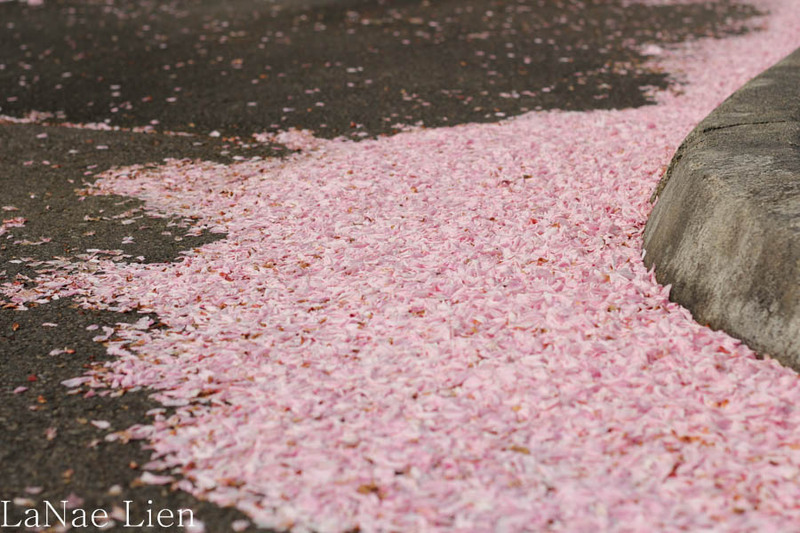 This spring I took advantage of a parking lot full of trees to capture the fallen petals. In this one, they gracefully follow the curve of the curb. Sigh. Can’t wait for next spring!! Well, maybe I can…my dahlias have started blooming and I don’t want to wish them away. Ah, that’s a perfect curve! Those blossoms look almost as pretty on the ground as they do on the trees. Thanks, Karen and I agree! Kwanzans have got to be about the prettiest flowering tree out there. A carpet of curvy blooms … just beautiful. Thanks! Nothing quite like one!